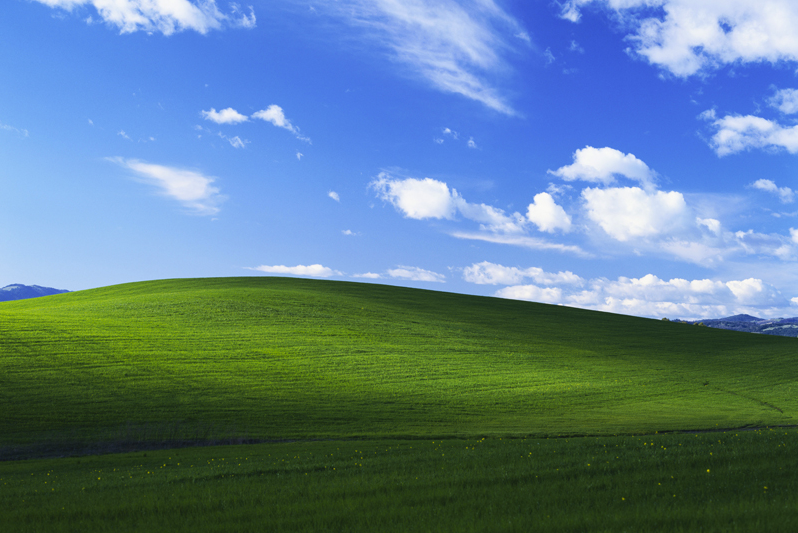 Microsoft wants to make sure you remember the famous image of the blue sky and rolling pasture that graced so many computer screens for so long. As the world mourns (or not) the end of the road for Windows XP—as of Tuesday, Microsoft is no longer offering support for the operating system—Microsoft Netherlands has posted this nine-minute film on its YouTube channel about XP's famous default wallpaper. The backstory is told by Charles O'Rear, the photographer who snapped the iconic picture, aptly titled "Bliss," in 1996 along a California highway north of San Francisco (reports seem to differ on whether it's Napa or Sonoma). The video is a bit slow moving, but is worth watching mostly because of O'Rear's amusement at having stumbled, quite literally, into the background of history, and because of the irony that the photo was, contrary to much speculation, shot on the kind of analog film that digital has rendered obsolete (though Microsoft ultimately cropped the shot and pumped up the greens before presenting it to users). Notably absent is any specific discussion of how much Microsoft originally paid O'Rear for the rights to an image that this video touts as perhaps the most viewed in history. O'Rear does point out that the original print was valued too highly for regular shipping services like FedEx to be willing carry it … but the courier's current maximum declared value for packages containing photos clocks in at a whopping $1,000, not counting for inflation. O'Rear has said in other interviews that the fee was the most he, previously a photographer for National Geographic, ever received for a photograph, and one of the largest amounts ever paid for a single shot. Still, as inoffensive—pleasant, even—as it is to look at, it's memorable mostly because it couldn't be avoided. So, while Microsoft deserves credit for having some fun with the news that it's retiring an era-defining product, it's also hard not to interpret it all as a legacy technology company lamenting its once-great history as its modern significance has waned.